I just received my TinyIOx. Nice looking piece. Tiny. It's going to be mounted in a location that it will be subject to water and I'd like to ultimately encase the board in potting resin. The switch for the terminating resistor. If I bury it in resin, I'd just have to make sure that, in the case I add more CAN components, that they are between the ECU and this particular TinyIOx and that they don't have a termination resistor or that it's disabled. Is that correct? I'd just have to always make sure this particular board is the end of the line? Is there any reason I can't, or shouldn't, desolder and remove the RS232 jack? Not going to be using it with Inovate O2's and a slightly lower profile wouldn't be a bad thing. It's going to be used with a MicroSquirt to data log additional pressure and temperature sensors. I read somewhere that when used with a MicroSquirt, the TinyIOx may need to be powered by a separate 5v power source, instead of the 5v sensor reference. Does this also mean that the additional sensors may need to be externally powered? If so, I assume there's a circuit that I can construct that would closely mirror or duplicate the MicroSquirt reference voltage? Or, maybe, not needed at all... just use the MicroSquirt's sensor reference power? I've read that I'll need to add circuitry between the sensors and the TinyIOx's 9 ADC's. jbelanger wrote: The minimum circuit I would use for an analog circuit is 2 capacitors and one resistor. The generic values I use are: a 1nF cap between the input signal and ground followed by a 1k series resistor and 0.22uF cap between the ADC input and ground. So you have a series resistor with a cap to ground on each side. You can have a look at the different MS schematics to have different variations. In total I'll have 5 temperature sensors and 4 pressure sensors. Is the following shopping list complete and correct? I've never shopped for this stuff before. What's the most economical way to order these? Just buy bulk qty's on Amazon? Or is there a supplier you can recommend that will piece the order together that's more cost effective? Is there any reason that I couldn't assemble these circuits "in-line" with the sensor lead wires and shrink wrapped externally to the potted TinyIOx, instead of on the prototyping or other board? One last question (for now LOL)... Can one of the two dedicated PWM out's be configured to be a Tach signal? I assume, if it can, that it may need some sort of pull up circuit to output a 12v signal. Possible to do? If so, what do I need? Sorry for the super long post. I'll summerize the questions to make them easier to respond to with yes/no where possible. 1) Okay to add aditional CAN devices if this unit is permanently made a terminating device? 2) Okay to remove the RS232 jack? 3) Do I need to create an external (to the MicroSquirt) 5v power source? And if so, for all the additional sensors too? --side thought-- I don't see the solder break to seperate the Vss from board power. Where is it? 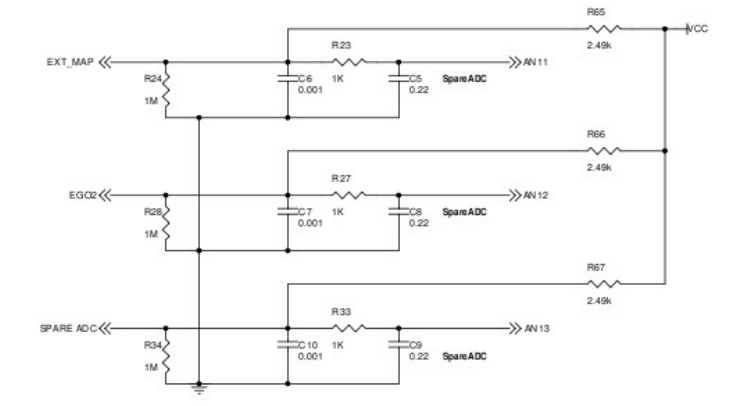 4) Buffer/bias circuits... Is the one pictured the correct one to use? 5) Buffer/bias circuits... Shopping list complete? 6) Buffer/bias circuits...Can I assemble the circuits in-line between the sensor and IO board? 7) Can a PWM out be configured to provide a tach signal? Thank you for your input and help guys. 6) Best way to order the components? Well i purchased a board, hope i can get it figured out, doesnt seem to be many people on here any more and information is very sporadic.